If you like elegant nail designs, you’ll enjoy this Reverse French manicure with an interesting twist. Like all Frenchies, it’s really quick to do. 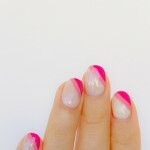 In just three strokes, your manicure transforms into a stunning Reverse French Manicure, also known as half moon nails. 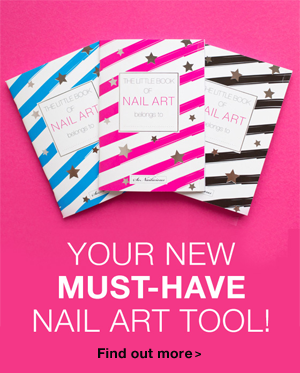 If you don’t have nail art brushes no problem, you can always use French manicure stencils! We’ve already made a step-by-step how-to for you here: French Manicure tutorial. 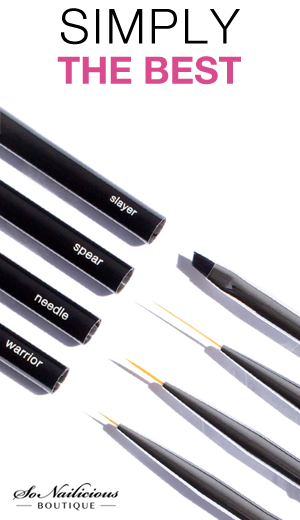 The dotted tips are even easier to do! Take any black opaque glitter topper, I used Ulta3 Outasight, and run over tips lightly. Add a top coat and you’re done! Now here’s the #ThrowbackThursday story behind this manicure. I did it just over 1 year ago when we were moving the SoNailicious office. I remember being surrounded by boxes while admiring the unusual colour of ORLY Classic Contours. Soon after I took my trusty nail art brush, added the half moon details some black sprinkles and a top coat then straight out the door to track down coffee in the new neigbourhood. Boxes can wait, a manicure & caffeine can’t! Nothing improves your mood like wrapping a flawless manicure around a freshly brewed coffee in winter! if you’re after an easier solution, use these French manicure stencils. What do you think about this Reverse French manicure? Adding the black sprinkles adds a little extra interest don’t you think? P.S. 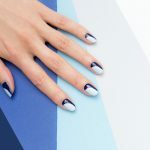 If you create nail art inspired by this tutorial, make sure you show us! 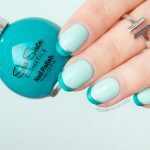 Tweet or Instagram us a photo with the tag #sonailicious We love seeing your work!